Indian Traditional Rangoli Designs are generally placed at the entrance of a home. They symbolize a welcoming gesture to the guests arriving at the residence during the Indian festival of lights. The floral designs are used to create a colorful and well-planned garden to celebrate the festival. The basic motifs used to create colorful designs include floral motifs, fruits, animals and birds along with different plants and leaves of certain trees like the mango and coconut tree along with the lotus flower and its leaves. The theme of Rangoli designs is very traditional but varies from season to season and on the occasion also. The floral theme is built around the use of creating vines, leaves and different flowers. Butterflies are used as an additional element to add beauty and movement in a graceful manner to these designs. If the traditional Indian Rangoli design is used to commemorate a religious theme then it will follow the particular religious leaning of the family. 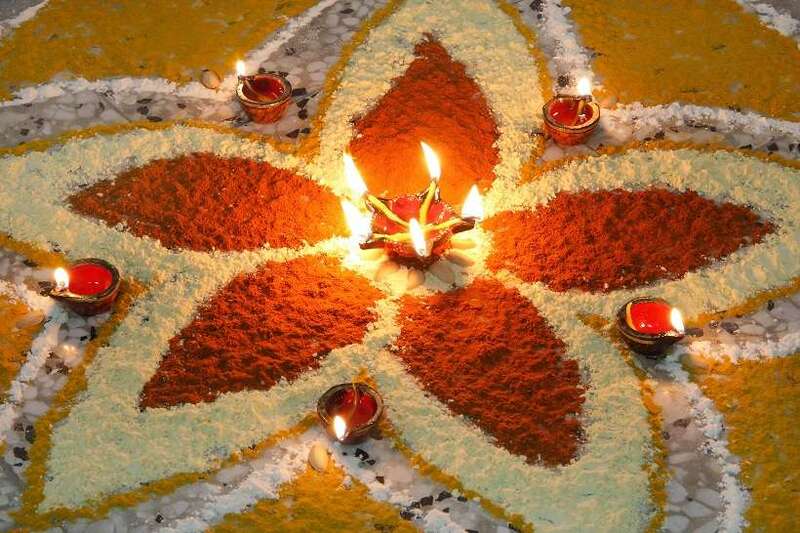 Festivals like the Onam and Diwali are common religious Indian events where the Rangoli design is used profusely. Over the years different cultures have merged in India and more than a religious element the Rangoli design is seen as a creative form of decoration during festivals and events. This may be utilized at Christmas time with the same elements that are used to create bells, reindeer, Santa Claus and different Holly wreaths. Basically you can use any repetitive design element to create the Rangoli in different colors to suit the theme of your event. You can utilize flowers in different colors to create a design of rice flour which is dyed in different colors. It is often seen that a batter of rice flour is colored and used to create long-lasting designs. You can use chalk and powder from a rock to create a geometrical design in various colors. Often the rice skin is burnt and then utilized to create the design. For a special pattern to be pasted on the walls, rice flour is mixed with a little turmeric powder and pasted on the walls. Select the specific design that you want to replicate when creating a Rangoli design, and draw it out on a piece of paper before you replicate it. If you are creating it on the floor or a wall make sure that the area is not located in a main zone where people will accidentally walk over it or touch it and smudge the design. Further you cannot remove the Rangoli and transfer it to another place so select the area carefully. Wipe the floor or wall with a wet cloth to clean the surface and make it even. Wait for this place to dry and then mark the center of your design. Use a piece of chalk to draw the outline of the pattern that you will utilize and fill in. Choose the color scheme and start filling in the pattern with the powder in your fingers. Start from the inside and work outwards and do not let the colors combine with each other.